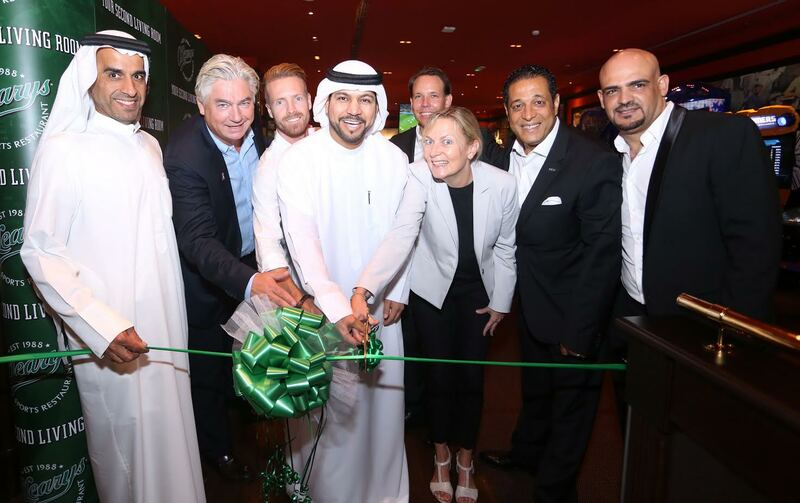 Mohammed Al Mazrooei, Assistant Managing Director, GGICO; Jonas Reinholdsson, CO Owner & Founder, O’Learys; Christian Wilhelmsson, General Manager, StarAgency Sport Management; Saeed Obaid Al Teneiji, Vice President – UAE Football Association; Christian Bellander (behind), CEO, O’Learys; Anette Nilsson Exner, Deputy Head of Mission, Swedish Embassy Mohamed Awadalla, CEO, TIME Hotels; Ahmed Ibrahim, Owner Representative, O’Learys Outlet. The authentic Boston sports-themed restaurant, O’Learys, founded by Swedish restauranteur Jonas Reinholdsson, has officially opened for business in Dubai. Saeed Obaid Al Teneiji, Vice President – UAE Football Association and Anette Nilsson Exner, Deputy Head of Mission for the Swedish Embassy were among some of the first guests to enjoy the casual dining experience, which includes a games arcade, a dedicated shisha area, a bar and of course the ubiquitous big screen TVs. Occupying a prime location on Sheikh Zayed Road, opposite Noor Bank metro station, the move marks TIME’s first O’Learys franchise in Dubai, following the launch of its debut outlet at Fujairah Mall in January 2016 – the company’s first ever non-hotel product. O’Learys was founded by Jonas Reinholdsson, a Swedish restaurateur who worked on the island of Nantucket, located south of Boston, Massachusetts, in the mid-1980s. He was inspired by Bostonian restaurants where people came to watch games and share their passion for sports, which he subsequently brought back to Sweden where he founded the first O’Learys in 1988 in Gothenburg. Named after his wife, Anne O’Leary, it was an immediate success, becoming a preferred casual dining venue for the community, visiting tourists and both local and international sports and entertainment celebrities.